In retrospect, this was a bigger fuss than was warranted. But, at the time there was a joke of ‘when will my love of [fandom] come back from war’ which summed up my feelings about the series. In 2015, I missed Syndicate for no reason besides I was just still unhappy. Ubisoft had let me known plenty. But it was getting praise for its inclusion of women and had the first trans character in the series. (And later learned also its first bisexual character.) The following year Pulse happened, and I was watching E3 trying to process what was happening to my community. I was hoping someone would say something because when bad things happen I feel like the world needs to take a moment. And it rarely does. Ubisoft’s conference comes on and everyone was wearing rainbow ribbons, and they take a second to express their own heartbreak for the community. And since they had been working on adding LGBTQ characters before this, it was enough. It was something. Come November, Watch Dogs 2 has another trans character who has an even bigger role, rainbow flags everywhere, you can visit gay clubs and flirt with whatever gender of your choosing, you can buy pride shirts and wear them for the whole game. The last four things are really minor, but WD2 is literally the only game that does that and it was nearly healing to see cut screens with PRIDE written on his damn shirt for half the game. Because of this, I think I should go back. 2013 wasn’t the greatest time and I kept thinking how about an abusive person got an Assassin’s Creed because of me. I still think of Assassin’s Creed as something that was in the past and lost. But one thing the queer community always does is reclaim things so since Unity seemed to better themselves I gave it a shot and played Syndicate. And ADORED it. I cannot fully express my love of Syndicate. It honestly might be my favorite in the whole series. If you quit Assassin’s Creed, play this one. If it doesn’t win you over nothing will. (At least nothing that is currently out). Everyone’s character feels real, and none of the customization mechanics feel clunky for the first time. The DLC has Darwin, and you can go ghost hunting with Dickens! Working backward I played Unity next. And oh boy, Unity was utterly and completely mismarketed. They pushed the multiplayer too much (which I never even got to play because no one else was playing Unity in 2017). Everyone expected a French company to tell us their history, and Ubisoft does not. Almost weirdly doesn’t. But it does do an incredibly good job at making all the actions a bit in the gray. Help Napoleon today, and you help the people. Help Napoleon tomorrow, and you are helping a tyrant. With patches, it’s no longer buggy and even though the controls are not as good as Syndicate it says a lot without giving you history or a ton of lore. Unity is about being a person living in a revolution. The hope that you can help, the struggle of not being about to save everyone and focused a lot on personal choices for a game that isn’t choose your own adventure. I had expected angsty romance and Templar apologist plot lines from the debut trailers, what I got was something truly honest about activism and chillingly timely for 2017. It also includes among the best speeches I’ve heard in my life. The Creed of the Assassin’s Brotherhood teaches us that nothing is forbidden to us. Once, I thought that meant we were free to do as we would. To pursue our ideals, no matter the cost. I understand now. Not a grant of permission. The Creed is a warning. Ideals too easily give way to dogma. Dogma becomes fanaticism. No higher power sits in judgement of us. No supreme being watches to punish us for our sins. In the end, only we ourselves can guard against our obsessions. Only we can decide whether the road we walk carries too high a toll. We believe ourselves redeemers, avengers, saviors. We make war on those who oppose us, and they in turn make war on us. We dream of leaving our stamp upon the world…even as we give our lives in a conflict that will be recorded in no history book. All that we do, all that we are, begins and ends with ourselves. At this point, I’m pretty much on an Assassin’s Creed high so for the first time pick up an Assassin’s Creed book. I’ve always been interested in them but skipped the because they were mostly game retellings. That is until, Assassin’s Creed Heresy. It follows Templars which is a huge red flag for me, but it’s Joan of Arc. She is like my Templar expectation always. Like Unity, the historical parts are set in France and it does a very good job of explaining very complex motivations in revolutionary times without excusing the harm that can be done. I had worried it would be a straight dude pining over Joan but again like Unity does not cheapen its female characters by doing so. I think this was largely because of the author choice. However, my one real complaint is the ending is weak and heteronormative. With those two points aside it does a brilliant job picking up from Unity. 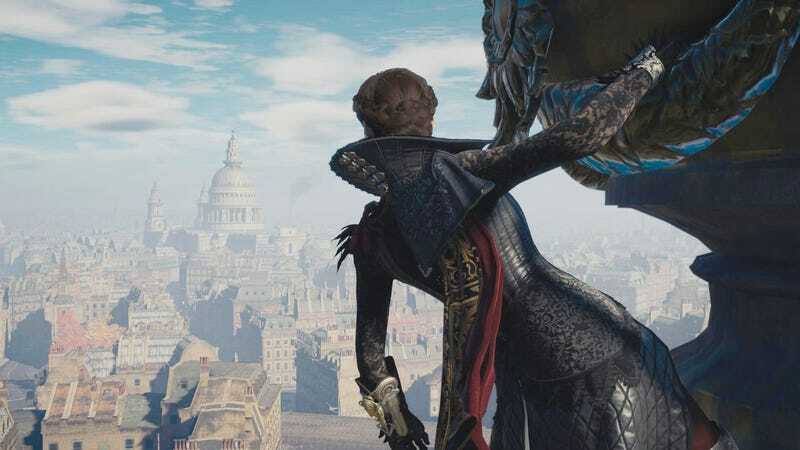 It mentions both Arno, the sword of Eden as well as showing an important Templar shake up we might see in future games. Having unfairly judged all of the above, I decided to go all the way back pick up Blackflag. I figure the boats are better, I love the series as much as I always have. I’m excited to play it before AC: Origins and just have an Assassin’s Creed filled year. If you want to see Shaun and Rebecca, play Syndicate. If you want to know about sages, read the Assassin’s Creed comics. They star Charlotte de la Cruz a Latina modern assassin and have a whole range of other modern assassin’s, an arc with a gay man who wants to avenge his boyfriend, and you see Erudito. I’m not in love with the art style but otherwise, I don’t know what more I could want out of them, to be honest. There are 3 trades that are out and a spin off series called Uprising (left) that introduces more people of color. I’ve also read the short run of Assassin’s Creed Locus which only has four issues. I don’t feel like it’s important to know lore wise, but it includes a disabled animus user and the arc covers why he wants to use the animus which I found both unique to the series and important when talking about ableism as a whole. In conclusion, if you dropped Assassin’s Creed because of too little focus on modern characters, clunky boat or other mechanics, and lack of diversity. Now’s a pretty good time to pick up what you missed without that brand new sticker price.